Samsung Pay is gradually growing into a major differentiating factor for Samsung. The convenience offered by Samsung’s mobile payment solution is slowly becoming a reason for customers to consider buying Samsung smartphones. Well aware of the potential, Samsung has been aggressively expanding the service to many markets around the world. 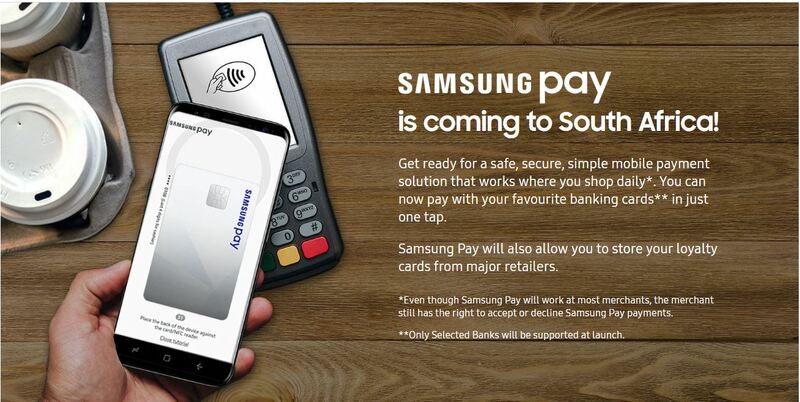 South Africa seems to be the next destination for Samsung’s popular mobile payment solution. Speaking to a media channel, Sung Yoon, the CEO of Samsung Electronics Africa, has announced that Samsung Pay will launch in South Africa around June this year. We first heard about the launch of Samsung Pay in South Africa in September last year. The service was expected to launch along with the Galaxy Note 8 in South Africa, but for reasons known only to Samsung, it’s not yet available in the country. With a dedicated page online, Samsung’s South Africa website also confirms the imminent launch of Samsung Pay. As usual, users need to have compatible Galaxy smartphones and supported cards to use the service when launched. The service has been receiving a positive response from Samsung users in all the markets where it is launched so far. There is no reason to believe South Africa will be any different. Samsung Pay has been expanding at a much faster pace than the competing products from Apple and Google. Apart from that the fact that Samsung Pay is available in more markets, it is also more widely accepted than any of the rival mobile payment solutions. While Google Pay and Apple Pay require NFC-enabled terminals to works, Samsung Pay works at almost every PoS terminal which accepts your debit or credit cards. Samsung accomplishes this by combining MST and NFC payment technologies into a single payment solution. It’s July already and still nothing. Perhaps it’ll launch with the Note 9.
yesss.. another country and little by little all around the world will have it,my wishes is when the all the countrys in the world have samsung pay, maybe will came to Portugal…..
Any plan for iranian users :)? Will the Galaxy A7 2017 edition be included in the list of those devices that will be supporting Samsung pay when it launches? For it also does support Samsung pay in other countries such as in the UK? Time to go back to the original South African S7 edge firmware for me. I will miss you Netherlands — with your speedy updates.